Progressions saw the day of light in 2003 at the legendary dance club Centro and has gone on to be crowned as Singapore's premier trance brand amongst as well as I-S Magazine's Top 5 club night in 2011. Since it's humble beginnings, to it's various ventures with many other local clubs as well as it's appearances in other Asian countries; to it's recent parties featuring renowned international guest DJs; the brand has held strong to it's consistency and it's motto to deliver an epic night out each and every time! 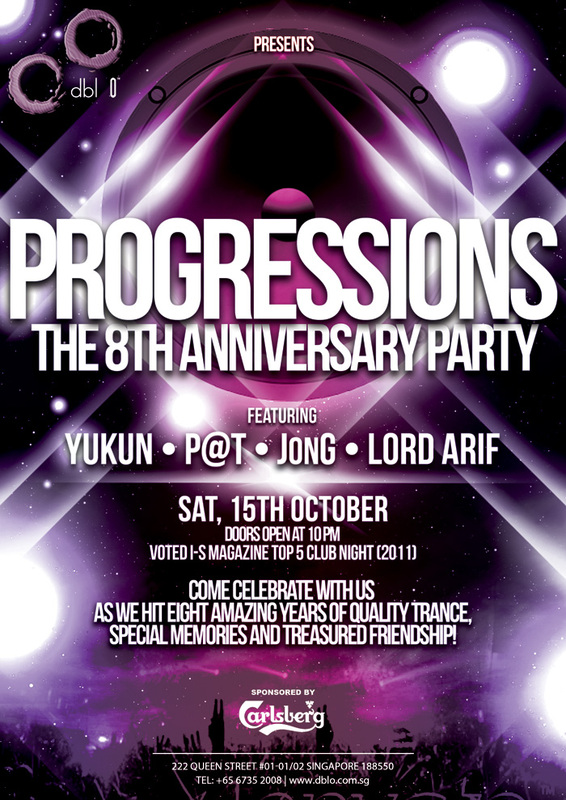 Join our iconic spearheading DJs Yukun and P@t, alongside their stablemates JonG and Lord Arif; as we celebrate EIGHT amazing years of quality Trance music, special memories and treasured friendship in this historical party.